I was just not impressed with the trailers of the movie doing the rounds for a while now on TV. The movie looked...boring to me and I was willing to skip it. Now I am glad I didn't. Because Lootera is not a movie to be missed. Its a movie to be savored, to be enjoyed like you would enjoy a slow and delicious meal which ends with a delectable dessert. The opulence in the movie is not overbearing, and I could connect with it right from the first frame. Every frame is beautifully planned and executed, I could feel the director's love for his masterpiece. But its not just the beauty of the movie that transfixes you, its actually the content that goes far in connecting with you. Not even for a moment I was disappointed with the relaxed pace, or the time the movie took to develop its principal characters. In fact, for me that was one of the most beautiful aspects of the movie. The pace of the movie slowly build up, reflecting in part the lives of its key protagonists. The movie helps you connect with the characters, you do not see Sonakshi Sinha or Ranveer Singh, but just see two people in love with each other. For the first time (to me at least) Sonakshi looks absolutely lovely in some of the shots, beautiful and very child like; and the star is thankfully missing. Similarly Ranveer the star is missing and the actor takes his place, though I would make him dub a few of his lines again (his diction gets blurred sometimes). Please guys do yourself a favor. Watch Looetra! I went for walk today ( I am in Kalyan) and checked the shows at Cinemax nearby... lootera in most screens... And finally read ur post! Did you see it Bhavin? How was it? 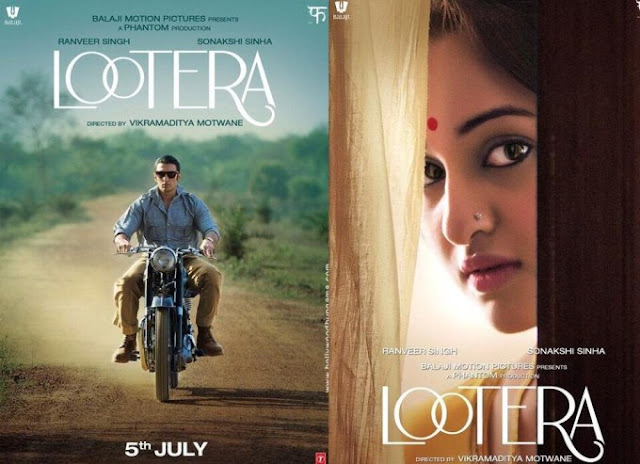 indeed lootera is movie to be experienced and not just to watch for the sake of watching another bollywood flick! True is the review. however, I felt that there was a certain vigour which was requried at some punches and high key-notes of the movie which was lacking. Had that been in place, the movie was fantastic. All in all, considering a 2.5 hours movie was based on just short story, it must have been challenging to build an entire plot around it. however. the efforts were not callous and blithe. one can see the research and the work that has gone into it. GREAT POST :) I really like your blog and I'm happy to follow.